Why do you want to participate in the EXECs Advocacy Program? What qualities can you bring to the success of the program? How would you describe Colorado's business climate? Which policy-related issues are you interested in? To what extent have you been involved in these issues (volunteering, campaigning, self-education)? Would you be interested in testifying at the Colorado State Legislature if the Colorado Chamber helped you prepared? Some of our programs may involve opportunities to go behind the scenes and into unusual spaces. Do you have any phobias or mobility impairments that we should be aware of so we can accommodate your needs to ensure you have the best experience. Please list dietary restrictions if you answered "Yes" above. How did you hear about the EXECs Advocacy Program? Please submit a current RESUME, BIO, and PROFESSIONAL PORTRAIT to Priscilla Varner, the program manager, at PVarner@CoChamber.com. By checking the boxes below, you've confirmed those items have been sent. Tuition and fees for the EXECs Advocacy Program are $2500. Additionally, space is limited to 30 individuals per class. (Limited scholarship assistance is available.) 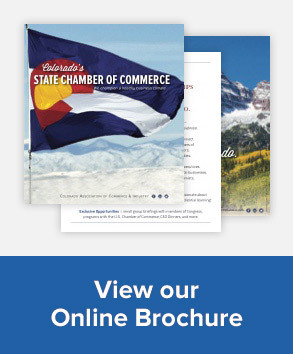 For questions, please contact the EXECs Advocacy Program Manager Priscilla B. Varner, pvarner@cochamber.com. Nominations for the EXECs Advocacy Program must have the support and commitment of a sponsoring business or organization. Please complete below.